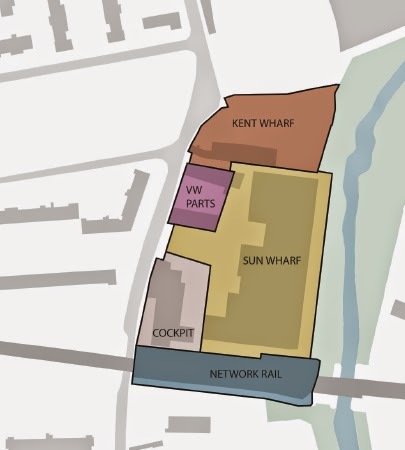 Crosswhatfields has already written in some detail about the planning application for Kent Wharf on Creekside, a parcel of land which extends from opposite Ferranti Park to the banks of Deptford Creek, and which now includes the VW parts dealer/garage directly opposite the end of Bronze Street. Sun Wharf, which is where Jones Furniture is currently housed, is expected to be redeveloped once Jones' lease expires in 2022 (or earlier presumably if they find another site and decide to move on before they are shown the door - one more sad employment loss for Deptford). It's another prime Creekside spot, so expect lots more high rise residential to be proposed. 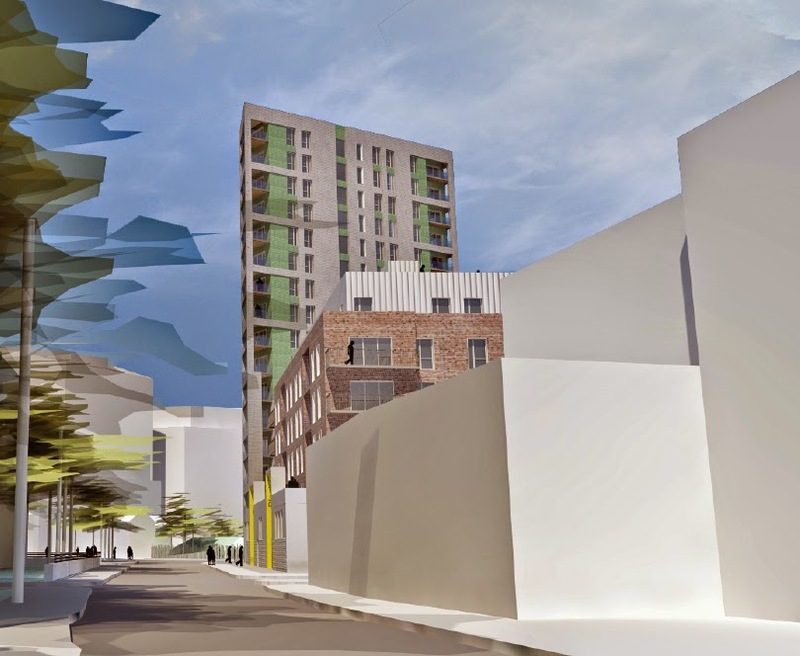 The planning application for this site is already with Lewisham's planning department and the 'official' consultation period ended early in January. But if you want to comment don't let this put you off; the planning officers will accept feedback right up to the time the application is considered by the strategic planning committee, although the sooner you get your comments in, the more likely they are to impact on the final report. As always, don't forget to copy your comments to your local councillors, as well as members of the strategic planning committee, whose details can be found here. Objections and other feedback is usually summed up by the planning officers for the purpose of the report, so it has a more direct impact if you copy it to the councillors themselves (assuming they read it of course!). 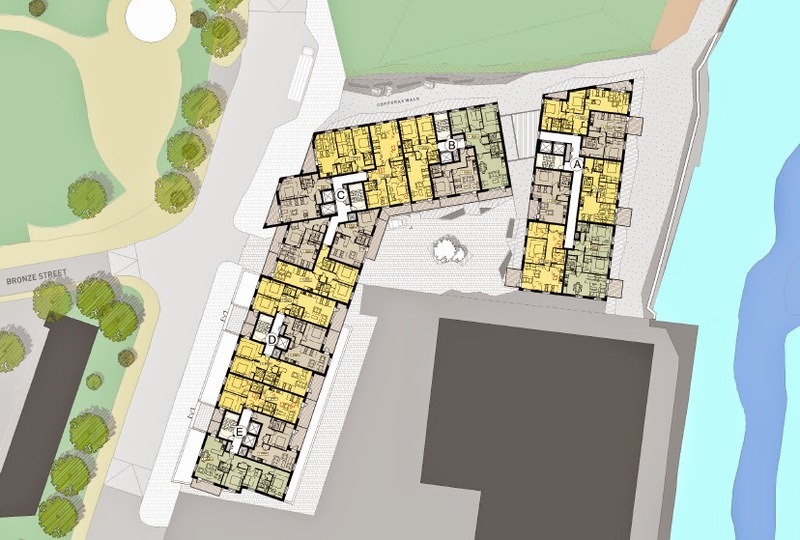 The application is for a mixed use development at Kent Wharf and 24a Creekside which will consist of three buildings ranging from six to 16 storeys, containing 143 flats and 1,375 square metres of 'commercial' floorspace. What kind of trees are those? Monster trees?! 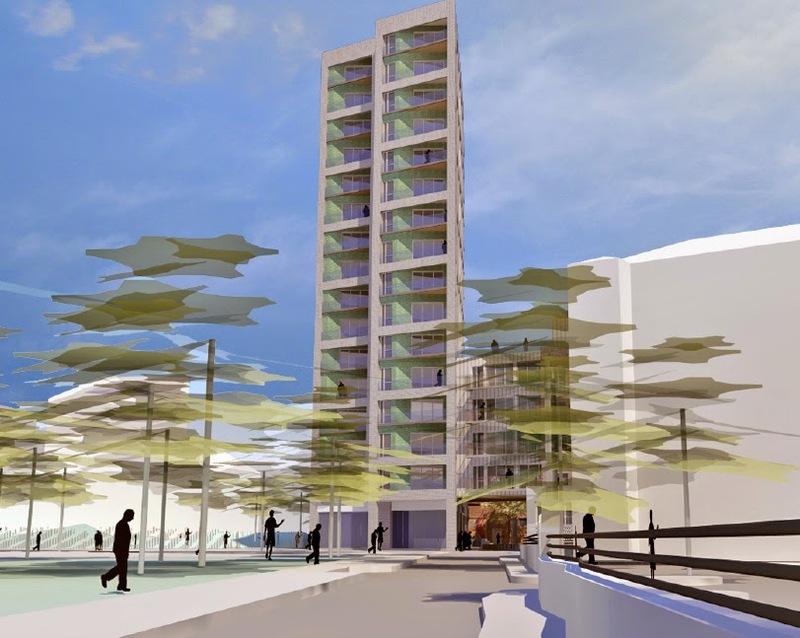 The 16-storey building has been put at the corner of the site, apparently after a series of pre-application meetings with council planners and feedback from the design review panel, much of which is detailed in the design & access statement if you want to read it. There's a lot of focus on how the buildings reached their final positions and layouts, but little on how they reached their final heights, which I would have been more interested to hear. As usual there seems to have been no consideration as to what is appropriate in terms of building heights for the area, with developers always benchmarking their proposals against the tallest examples they can find. 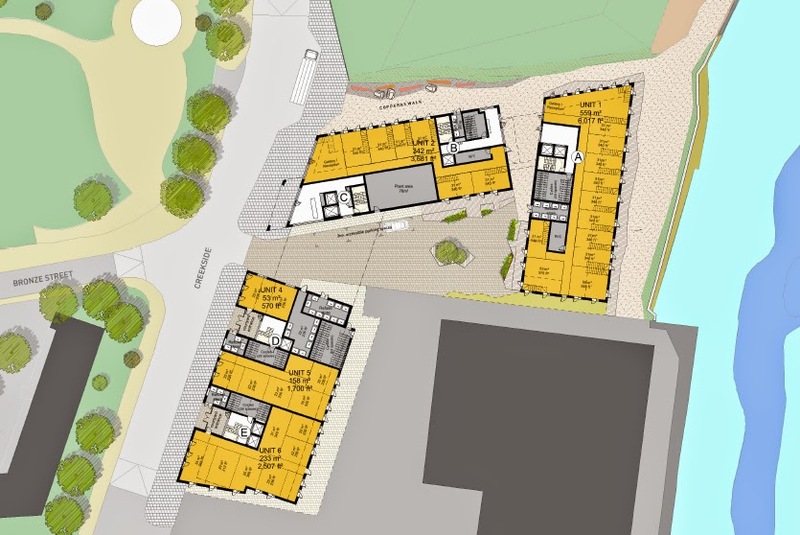 It would be so refreshing to read a design statement explaining how the architects had put together a masterplan that respected the four-storey neighbouring residences rather than ones that competed with a series of blocks three streets away. They nearly always try to justify towers as creating 'landmarks' and 'way finders' but fail to acknowledge that it's going to be impossible to identify one from the other when they are all the same height and block views of anything but the street and the nearest facade. In the case of this application, the height of the buildings is my biggest gripe, mainly due to the impacts they are going to have on the neighbouring land, in particular the public spaces and parks which will suffer much greater shadowing as a result. But is there any process for measuring this loss of amenity? 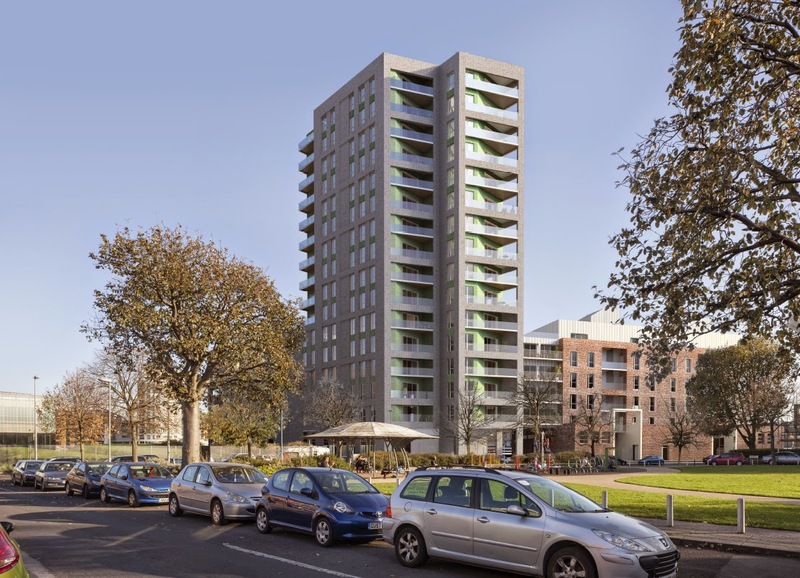 Some of the flats on Crossfields estate will also lose light as a result of the tower and they have a case for objecting - ultimately though the greater good of building more housing will no doubt prevail over the quiet enjoyment of a handful of residents. The view along Creekside with the three-storey Cockpit Arts in the foreground. More monster trees! Just one more word about scale: the elevation above, which is looking directly at Kent Wharf from the Deptford High St direction, is useful in that it shows the scale of the smallest buildings - you will have to peer on the extreme right of the image where you can see the Cockpit Arts studios coming into view. And below is a mock-up of the scheme in situ, although the only item for scale here is the shelter in Ferranti Park. Of the 143 housing units, only 18 will be allocated to anything other than private ownership. They will be 'intermediate', which is officially defined as 'homes for sale and rent provided at a cost above social rent, but below market levels subject to the criteria in the Affordable Housing definition. These can include shared equity (shared ownership and equity loans), other low cost homes for sale and intermediate rent, but not affordable rented housing'. As a percentage of the whole development it's pitifully low, even in these supposedly straitened times. I hope the planning committee will raise this as an issue since it now seems to be a favourite theme for Lewisham's mayor. 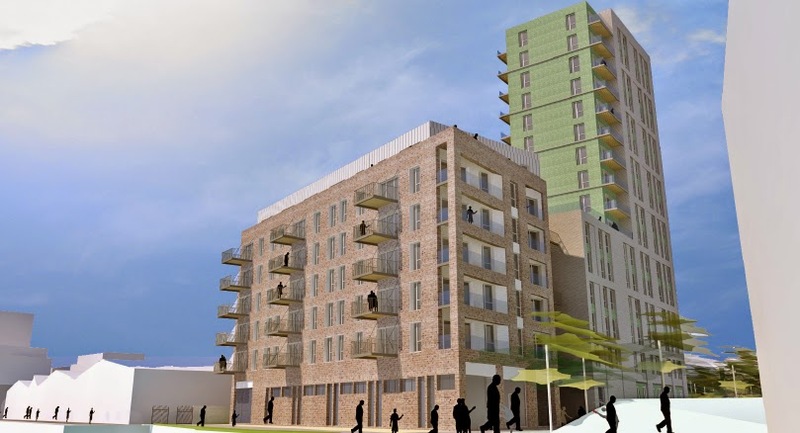 I put this rendering in to show the view from street level, although it was cropped in the report, preventing me from enjoying the full rearing presence of the main tower. The inclusion of only two cars makes it look very weird, especially without any of the double parking that's usually rife along this stretch of Creekside. Which brings me to traffic and parking. 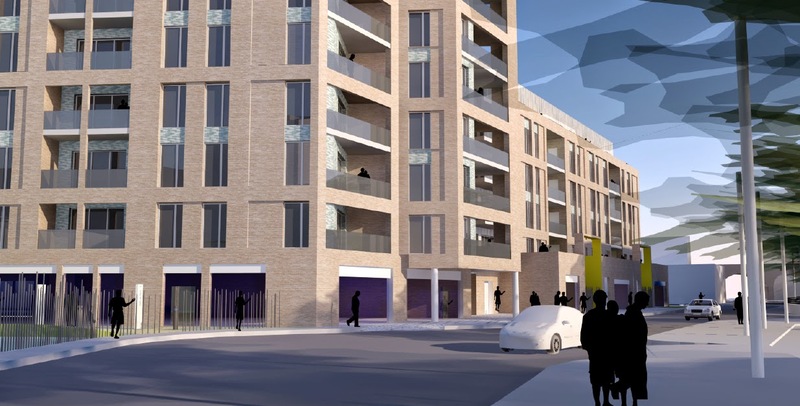 The development includes just three car parking spaces, which I welcome wholeheartedly. The cycle parking provision is not as good as it could be, but still generous. Of course the lack of parking will encourage the new residents to use the surrounding streets - already heavily overloaded both in daytime with local workers and commuters and overnight with residents - making the introduction of a controlled parking zone inevitable. However the site's proximity to the boundary with Greenwich will need the two to work together if this is going to be successful. According to the transport assessment, residents of the new blocks will not be eligible to apply for parking permits if and when a CPZ is introduced. Construction traffic is stacking up to be a major problem on Creekside - not necessarily due to this development, but the cumulative impact of the multiple developments that are expected to move to construction shortly. Everyone makes noises about using Deptford Creek for material deliveries and spoil removal, but no-one has made any effort to actually put it into practice. Don't forget the Thames Tunnel shaft is expected to start construction some time soon, requiring Deptford Church Street to be shut down to just two lanes for a period of three years, and requiring a predicted 140 vehicle movements per day. Faircharm redevelopment is estimated to require 180 vehicle movements per day so Kent Wharf's 20 vehicles (or 40 vehicle movements) is a mere drop in the ocean. But with the two sites next to Creekside Village having applications pending, not to mention Convoys Wharf, we look set to be dodging HGVs for the next five years or more. I was particularly confused to read that construction traffic is only being allowed to come via the A2 because the lifting bridge on Creek Road is dodgy (er, get it fixed? It has no weight limit posted as far as I can see). The travel plan suggests construction traffic should turn along Creekside at the Birds Nest roundabout which seems like a particularly risky route - not only will traffic be snarled up by the heavy parking that Creekside endures, but it will direct traffic along a quite major cycling route. HGVs and cycles? Rarely ends well. I also gave a hollow laugh when I read that construction workers would not be allowed to park on the roads in the vicinity, and this would be policed by the contractor. The shambolic situation on Norman Road and surrounds (cars parked halfway up the Ha'penny Hatch footpath) when the Movement was being built was brought to mind, and the efforts and nagging I know people had to exert to get the situation resolved to any extent. It's a fine aim but in my opinion not worth the paper it's written on - many subcontractors are expected to bring their own tools and equipment and in practice I cannot see how this can be imposed. One of the positives aspects which the design review process seems to have brought to this development is accessibility to the creek and some level of permeability on the site. A new path will open up access to the Creek, and presumably link into one alongside the Laban (otherwise it will be an utterly pointless dead end). A walkway leads into what they are classifying as 'semi-private' space - on paper a nice idea but even in this rendering I can't help wondering what those shady-looking characters are doing hanging about in the underpass. Thanks Dame (And Crosswhatfields) for such in depth reporting. I doubt anything other than the habitual money screwing concerns of the developers will be listened to by the council. They have little incentive to prevent such schemes since they all divvy up 106 money. Money that I can't help think is just being used to offset cuts made by our Austerity (Labour and Tory) overlords. Still, I expect we'll all be happy once the poor have been swept away by the galloping concrete and steel gentrification. Oh I wouldn't worry about the poor being swept away from Deptford. There's plenty to go around. Have to confess it does get up my nose a bit that everyone in deptford kicks off when private housing is planned. Surely Deptford has one of the highest proportions of social housing in Britain? I don't know for a fact, but walking round it seems every street is social housing? Surely a MIX of tenures and people is what makes a vibrant and successful area? I definitely don't want to support greedy developers, but let's not get snotty that some peeps with money might move in...especially when I'd guess 90% of all housing stock is social? (I would be genuinely interested if anyone has figures on this). And before anyone talks of the poor being priced out. I'm afraid the days of average wage/average home passed by sometime in the 80s, not saying it's right, but I'm pretty sure it would be hard to reverse. @anon 9.43 yes Deptford has a lot of housing stock originally built as social housing. However a large proportion of it is now in private ownership as a result of the 'right to buy' initiative introduced by Margaret Thatcher. Some of these privately owned former council properties are even leased back by the council to address their housing requirements. So instead of paying social housing rent levels the council (via the taxpayer) is paying private rental levels to house people. Low-income families who might otherwise have been able to pay their rent themselves now have to rely on housing benefit, which also undermines the self-esteem of those who want to try and support themselves. The council (again via the taxpayer) also pays to house 600 families per night in so-called 'bed & breakfast' accommodation (which does not include breakfast) since it cannot provide long-term accommodation for them. Walking round the streets looking at housing stock will not give you the full story. @ anon9:43 - I agree, it's areas like Chelsea etc that need to be forced to build more social housing, not SE8 which is already heavily skewed. A healthy balance is required in all areas of London. Sorry, don't buy the Thatcher sold off the housing argument that always gets dragged out. She actually built more council housing than labour did in their time in office but that is often quietly ignored. The lack of parking provision, together with the restriction on applying for a parking permit for any future CPZ, seem ridiculous. I know we should be trying to encourage people to use public transport where possible, but there will always be some people who will need a car. This could among many, many other possibilities) be due to a lack of mobility or having a job that requires the transporting of heavy / bulky items or which requires frequent visits to various parts of the country. Providing a tiny number of parking spaces could well result in more on-street / illegal parking in a wider area, and unfairly impact those for whom a car is not simply a luxury. @anon 9.43 - The Mouseprice website has very good stats on housing stock by district. SE8 has 21.2% owner occupied (vs national average of 63.5%) and social rented housing* at 47.7% (vs national average of 17.6%). So whilst not 90%, every other house in SE8 is social rented which is quite phenomenal really. I've tested some other postcodes that usually spring to mind with high social housing, east London etc and SE8 so far has by far the highest amount. * Owner Occupied refers to all households which are owned by the person who lives there, regardless of whether or not they have a mortgage. It also includes properties with shared ownership. Socially Rented refers to all households which are rented at a subsidised rate. This includes council houses, housing associations or Registered Social Landlords (RSLs), housing co-operatives and charitable trusts. Actually, doing a bit more digging they also allow you to graph the 2011 Census data, and you are right, significant parts of SE8 are 90% social housing. For copyright permissions please email deptforddame at yahoo dot co dot uk. Deptford Dame. Awesome Inc. theme. Powered by Blogger.